In the midst of political unrest and economic devastation, Venezuela’s oil exports have plummeted by 40 percent in the last 3 years. 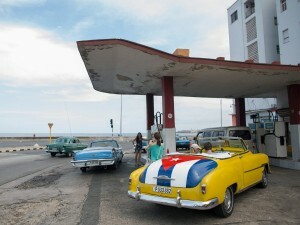 During an export drought that lasted the better part of last year, the Cuban government has been combatting the stemmed fuel flow with regular energy rationing. In an attempt to avoid blackouts, the government has ordered cuts in electricity and fuel consumption to most state-run companies and entities (a huge pool in a communist country) by 50 percent, resulting in workers hours slashed and access to vehicles severely restricted. This April, they also began restricting sales of premium gas to government officials and diplomats. Cuba is currently probing for oils in its own offshore wells, with some hope for a vast untapped reserve, but so far they’ve run dry. In response, they’ve reached out to an old friend--Russia. Just last month, Russia exported its first shipment of oil to Cuba in decades. The tanker, carrying 250,000 barrels of Russian oil, was just the first installment of a total 1.9 millionbarrels to be sent by the Russian government-owned oil company Rosneft. It’s unknown if the deal is to be extended after the total is reached. It is almost certain that Cuba’s weak economy will continue to need the aid, but the Russian government has made it clear that this is not a hand-out--there will be no more oil if Cuba doesn’t have the cash to back it up. Unlike Venezuela, who allowed Cuba to build up an unpaid tab for oil imports, Russia has announced that they will give no leniency to the cash-strapped nation. Read the original article on OilPrice.com. Copyright 2017.